Canada today becomes the second country to legalise marijuana, as it seeks to turn the black market into a regulated, taxed system after nearly a century of prohibition. Years later, it's no joke. The tomato and pepper plants that once filled some of those greenhouses have been replaced with a new cash crop: marijuana. Beren and other formerly illicit growers are helping cultivate it. The buyers no longer are unlawful dealers or dubious medical dispensaries; it's the Canadian government. Today, Canada becomes the second and largest country with a legal national marijuana marketplace. Uruguay launched legal sales last year, after several years of planning. It also stands in contrast to the United States, where the federal government outlaws marijuana while most states allow medical or recreational use for people 21 and older. Canada's national approach has allowed for unfettered industry banking, inter-province shipments of cannabis, online ordering, postal delivery and billions of dollars in investment; national prohibition in the US has stifled greater industry expansion there. Hannah Hetzer, who tracks international marijuana policy for the New York-based Drug Policy Alliance, called Canada's move "extremely significant," given that about 25 countries have already legalised the medical use of marijuana or decriminalised possession of small amounts of pot. "It's going to change the global debate on drug policy," she said. "There's no other country immediately considering legalising the non-medical use of cannabis, but I think Canada will provide almost the permission for other countries to move forward." At least 109 legal pot shops are expected to open across the nation of 37 million people, according to an Associated Press survey of the provinces, and many more are to come. 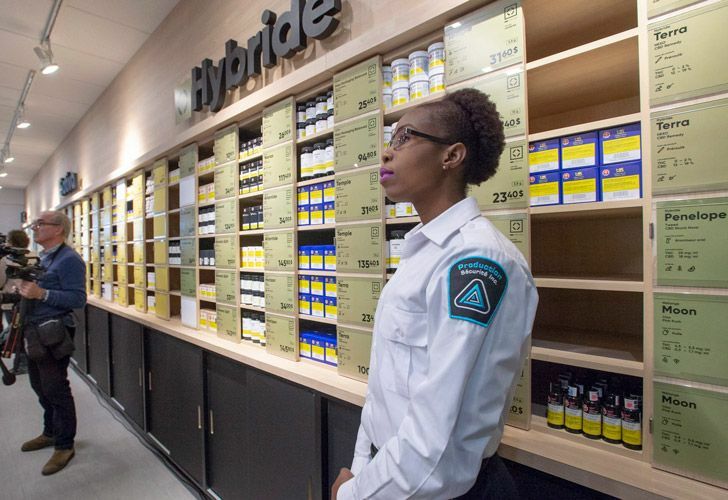 For now, they'll offer dried flower, capsules, tinctures and seeds, with sales of marijuana-infused foods and concentrates expected to begin next year. Federal taxes will total US$1 per gramme or 10 percent, whichever is more. The feds will keep one-fourth of that and return the rest to the provinces, which can add their own markups. Consumers also will pay local sales taxes. British Columbia, home of the "BC Bud" long cherished by US pot connoisseurs, has had a prevalent marijuana culture since the 1970s, after US draft-dodgers from the Vietnam War settled on Vancouver Island and in the province's southeastern mountains. But a change in government last year slowed cannabis distribution plans there, too, and it will have just one store ready next Wednesday: a state-run shop in Kamloops, a few hours' drive northeast of Vancouver. By contrast, Alberta expects to open 17 next week and 250 within a year. The federal government has licensed 120 growers, some of them enormous. Canopy Growth, which recently received an investment of US$4 billion from Constellation Brands, is approved for 520,000 square meters of production space across Canada. Its two biggest greenhouses are near the US border in British Columbia. Next to Canopy's greenhouse in Delta is another huge facility, Pure Sunfarms, a joint venture between a longtime tomato grower, Village Farms International, and a licensed medical marijuana producer, Emerald Health Therapeutics. Workers pulled out the remaining tomato plants last winter and got to work renovating the greenhouse as a marijuana farm, installing equipment that includes lights and accordion-shaped charcoal vents to control the plant's odour. By 2020, the venture expects to move more than 165,000 pounds (75,000 kg) of bud per year. Officials say they intend to accommodate craft growers but first need to ensure there is enough cannabis to meet demand when legalisation arrives. Hiccups are inevitable, they say, and tweaks will be needed. Legalisation will be a process more than a date, Farnworth said. "October 17th is actually not going to look much different than it does today," he said.